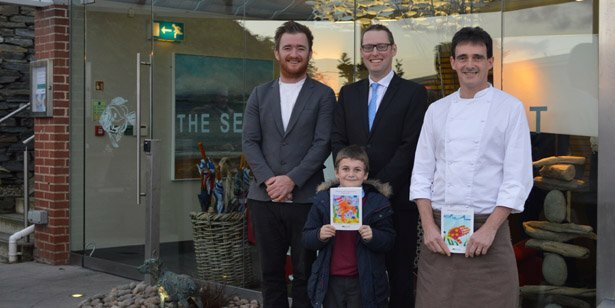 Rick and Jill have chosen Alfie Maloney and Ariana Bull as winners of our children’s art competition, where we asked mini-Stein’s to design the new menu front cover for our annual charity lunches at The Seafood Restaurant. As well as seeing their design displayed on the new menus for the lunches, Alfie, aged 6 and Ariana, aged 4, won a family meal at Stein’s Fish & Chips in Padstow. This year our annual charity lunches are raising money for Children’s Hospice South West. Alfie, a pupil at Padstow School just up the road from The Seafood Restaurant, created a lobster collage inspired by his memory visiting the Lobster Hatchery in Padstow. Our second winner, Ariana, age 4, designed a clown fish handprint, inspired by a clown fish she saw in an aquarium in Majorca. The trip was a family treat following difficult surgery in which she had a tumour removed from her neck, thankfully now better. We were delighted to welcome Alfie and his family to The Seafood Restaurant to collect his prize where he met Jack Stein, head chef Stephane Delourme and restaurant manager Ben Wilson, who took him into the kitchen to meet all our chefs and some real-life lobsters. If you haven’t come along to our charity lunches yet, make sure you book a table, they’re running until Friday 12th February from 12 – 3.15pm.